Due to the success of their workshop space, Teasel & Tweed are looking to plan for the rest of the year. 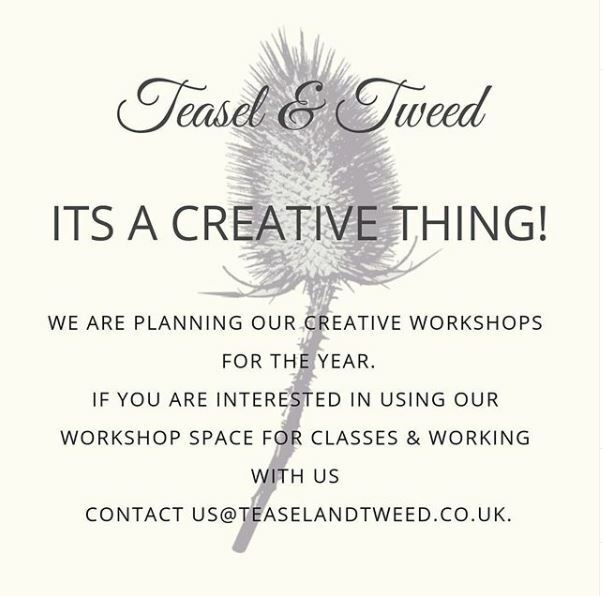 Anyone interested in using their creative workspace or running classes with them, please contact us@teaselandtweed.co.uk. Teasel & Tweed sell a wide range of unique items, such as bespoke pieces of furniture, handwoven textiles, industrial lights and thoughtful gifts for the important people in your lives. Each item is carefully selected and sourced to offer a varied and ever-changing choice. Feeling creative? Why not book in for one of their many courses? Alternatively, feel free to pop in and hello! Zoe & Lin are always pleased to see new faces and regulars alike (plus the many tourists with their travel tales).